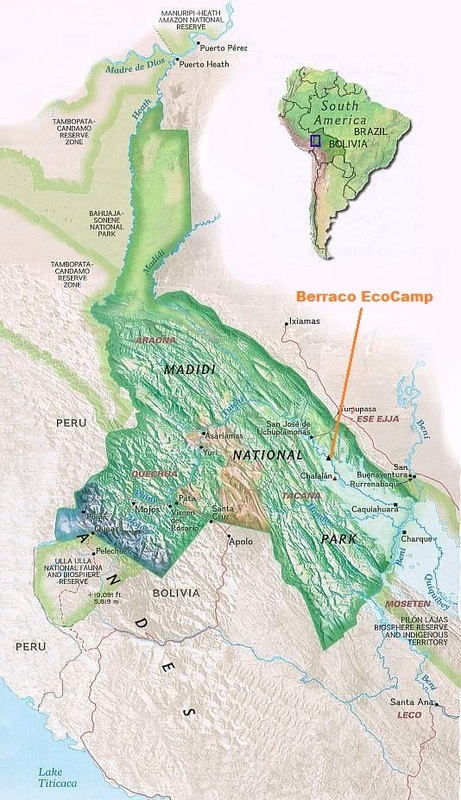 Situated in the heart of Bolivia's Madidi National Park, the rainforest EcoCamp is accessible from Rurrenabaque by a six-hour scenic boat ride up the Beni and Tuichi Rivers. The ride offers panoramic views of mountainous Amazon landscapes and opportunities for wildlife viewing along the riverbanks. Caiman, capybara, and exotic birds are common sights from the boat. The EcoCamp is surrounded by primary rainforest. Primary forest refers to untouched, pristine forest that exists in its original condition. This forest has been relatively unaffected by human activities and contains the oldest trees, dating back hundreds of years. Primary rainforest is often characterized by a full ceiling canopy and usually several layers of understory. The ground floor is generally clear of heavy vegetation because the full canopy allows very little light, necessary for plant growth, to penetrate. Primary forest is the most biologically diverse type of forest. Don't forget to check out our Photo Gallery and Plan Your Trip section to learn about the adventures we offer at the EcoCamp. Butler, Rhett A. “Diversities of Image - Rainforest Biodiversity.” Mongabay.com / A Place Out of Time: Tropical Rainforests and the Perils They Face. 9 January 2006. http://rainforests.mongabay.com/0305.htm. Berraco del Madidi's office in Rurrenabaque is located on the corner of Calle Comercio and Vaca Diez. We are open every day from 8-12:00 and 15-19:00. Rurrenabaque is a small jungle town located on the Beni River. 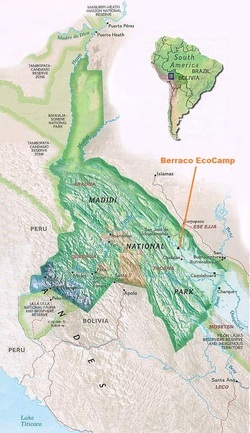 It is the access point to Madidi National park and the Bolivian Plains (Pampas). Please click here for more details about Rurrenabaque. We would be happy to make recommendations regarding accommodation, restaurants and/or any other services in Rurre that you might need. Amaszonas has several flights daily. We offer complementary airport pickup and drop off service. Please include your flight information in your reservation correspondence.